Our Earth is one of the nice planets of our solar system. The Earth is the third planet from the sun. It is the only known planet that supports life. No life is found on any other planet except Earth. The earth was formed millions of years ago. At that time, it was a huge hot ball of rocks and gases. When the Earth was formed there was no life on it. As year passed, the outer surface of the Earth cooled down because of the rain. All of us live on the outer surface which is known as the crust. But the Earth is not the same deep inside. We think that the whole earth is cool. But, it is not so. Only the outer surface of the Earth is cool while it is extremely hot inside. Below the crust is the mantle, which is made up of very hot molten rock. In the centre of the Earth is a hot solid ball of many melted metals. 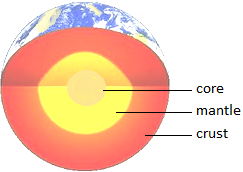 This central part of the Earth is called the core. It is the hottest part of the Earth. We have heard of volcanoes giving out hot lava and causing great damage. Volcanoes are actually cracks or holes in the crust of the Earth. Molten rock, called magma is sometimes forced out from the mantle of the Earth through these cracks or holes. The magma that flows out is called lava. It is red hot and hardens to form rocks on cooling. This shows how hot the Earth is deep inside. We often hear that the Earth is like a round ball. Actually, it is not perfectly round. It is slightly flattened at the top and bottom. It looks like a beautiful blue ball from outer space.